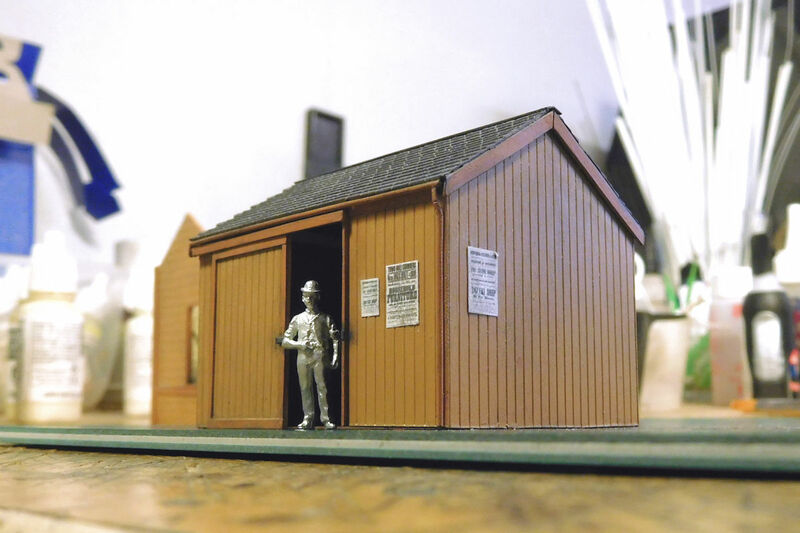 I’ve scratchbuilt some more buildings for Farthing. 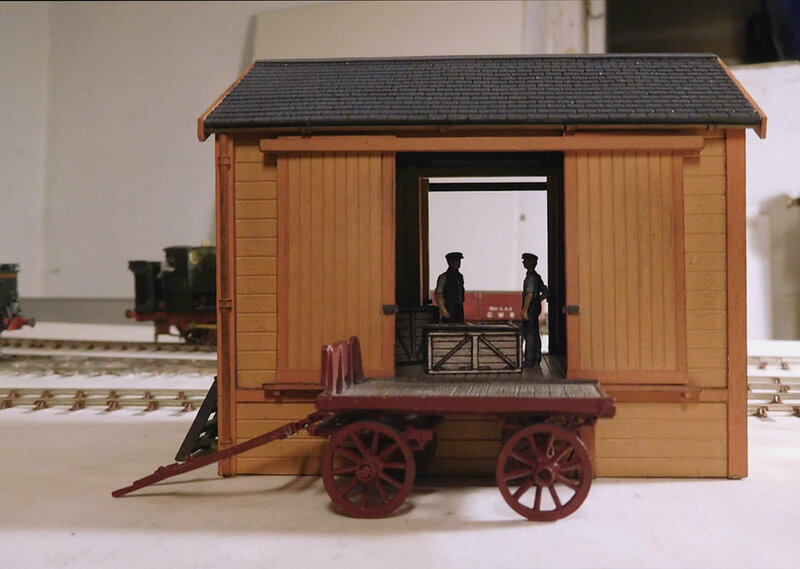 First up is this small goods shed, adapted from a prototype built by Eassie & Co. at Speech House Road station on the Severn & Wye. The contractors Eassie & Co. had an interesting history, nicely described in this PDF file by the GSIA. The prototype had a brick base, but I decided on a timber base and a few other detail changes to suit my tastes. The roof is detachable so I can detail the interior. The doors are modelled open so you can see what’s going on inside. I like the effect but it does add to the time and cost as you have to model the interior walls and framing too. 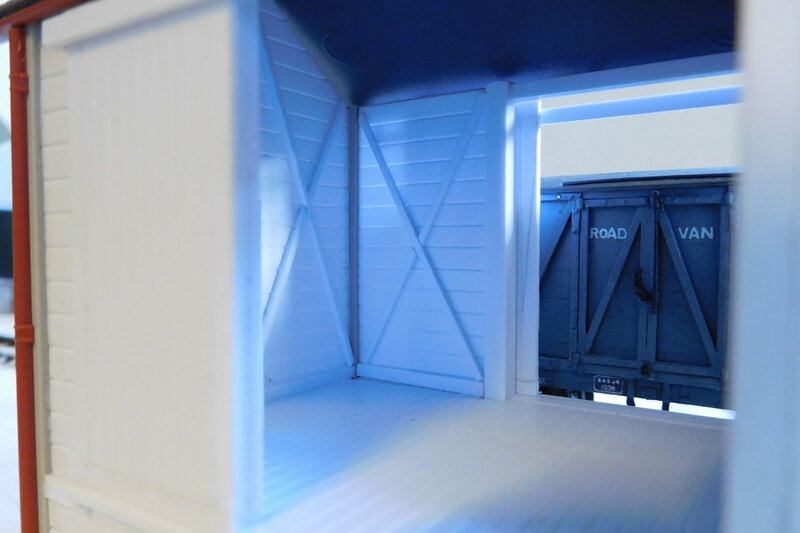 One reason I chose this prototype was the potential for a nice view through the open doors across the tracks, in line with my preference for “see through” structures at the front of layouts. There’s also a view through the side door. The prototype had the door right up against one corner, probably to save space inside. It looked odd in model form though, so I moved it. If only the real world was so easy to change! Here’s another little building I’m working on. 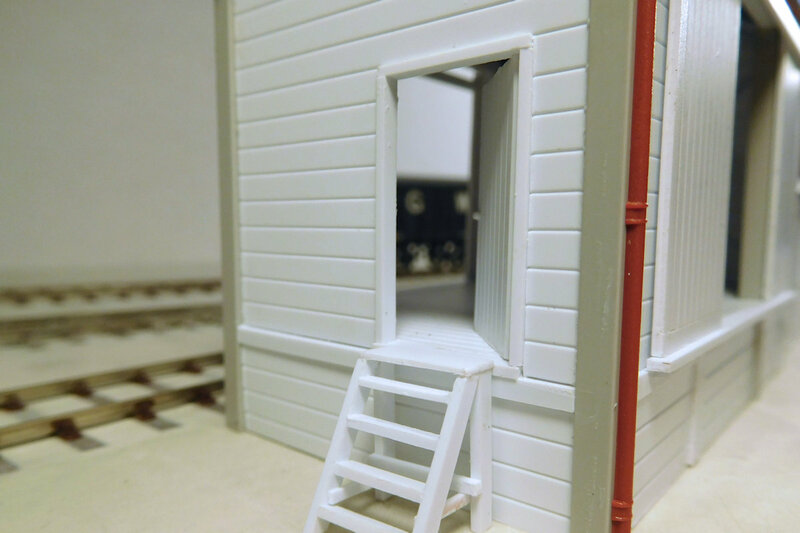 This is a lock-up/storage room based on a prototype at Long Marston. There was a very similar structure at Lustleigh. My version is some 25% larger than the prototype, in order to add a bit of mass. 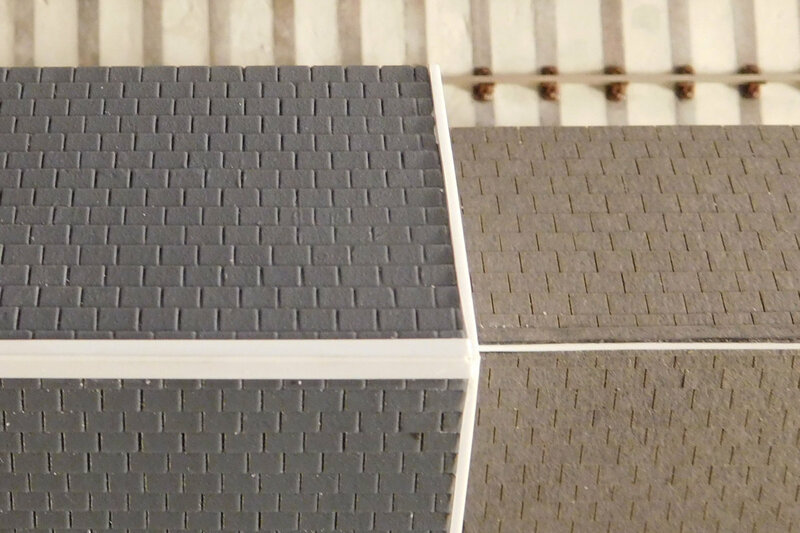 I normally use the Wills sheets for slate roofs, but on this lock-up I thought I’d try out the slate sheets from York Modelmaking. I have seen them used with very convincing results, not least on Iain Robinson’s wonderful creations. Unfortunately I had forgotten how sensitive paper can be to glue stains and bending/fraying at the edges. Experienced card modellers would no doubt have made a better job of it! 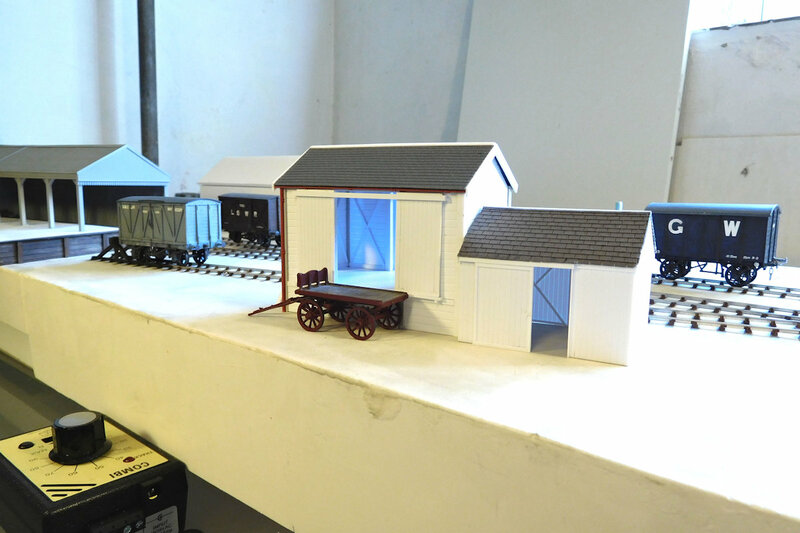 Here’s a direct comparison between the Wills sheets (left) and the York Modelmaking strips (right) before painting. I’m really not very happy with the roof, and may give it another try. Incidentally the prototype photo doesn’t seem to show any gutters or drainpipes, which puzzles me a bit. The buildings in place in the Old Yard at Farthing. 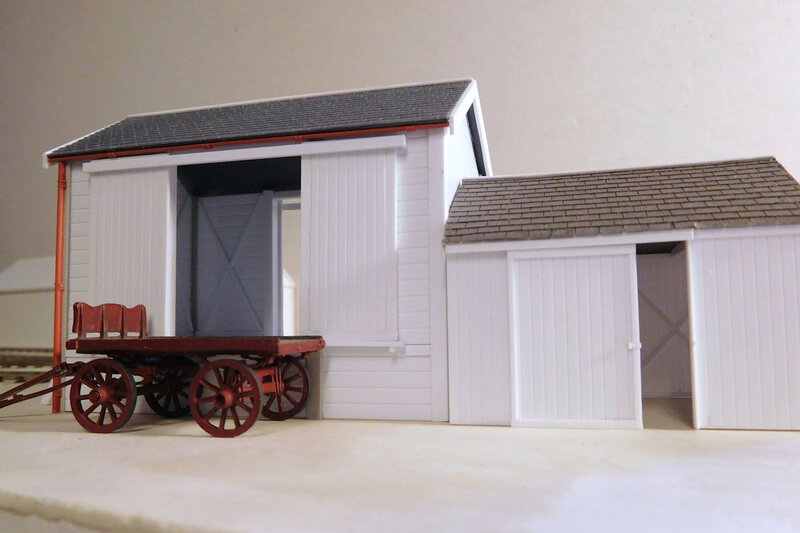 The shed painted and showing the see-through effect. The lock-up on the workbench, ready to embed on the layout.